Women’s liberation was just getting started in the late 1960s and early 1970s. A great awakening was taking place for those of us who came of age in that era. We could aspire to do almost anything a man could do, from joining the army to joining a rock band. Yet true equality was still elusive. Women didn’t go into combat, and only a few clamored to. Music, however, was opening up. The great all-girl groups like the Supremes and the Ronettes were giving way to mixed lineups like the Jefferson Airplane and Fleetwood Mac. Still, I suspect that even when a woman’s musical gifts were appreciated and utilized, men continued to dominate these bands. They weren’t above treating talented women like glorified groupies. Handmaidens of Rock, my fourth self-published novel with iUniverse, deals with this theme. My three heroines, high-school girls who hook up with a rock band and go along for the ride, are all ambitious in their own right. Although madly in love with their respective musicians, they are increasingly influenced by cultural trends such as feminism, social protests, drugs, colorful clothing, mysticism, and free love. My heroines are not destined to remain “handmaidens of rock,” however fun and exciting that might seem at first. The rock band proves too combustible to rely on for their own self-worth. When the inevitable explosion occurs, they must rise from the ashes and begin to fulfill their separate destinies, conquering new arenas in journalism, the fashion world, the theater, and politics. 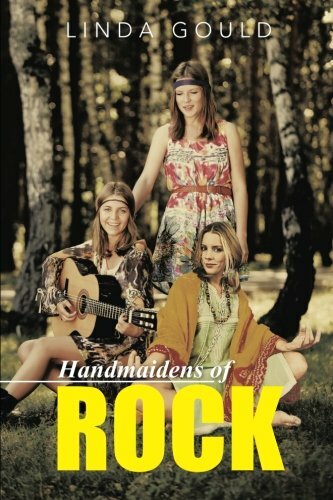 Handmaidens of Rock, I hope, strikes a blow for those early stirrings of female power.